Pelican Protector Industrial, Sport and Professioanl Cases are designed for active professionals. Pelican Protector Cases are watertight and unbreakable. The incredibly light structural foam resin shell is highly durable and is unaffected by dents, scratches, or corrosion. Inside, pre-scored "Pick n Pluck" foam or padded dividers protect even the most sensitive equipment. Pelican Protector Cases are sized for every need. They meet and far exceed the highest standards of industrial, airline, military and commercial applications. Pelican Protector Cases provide no-nonsense hard knocks protection coverage for on-the-job situations, regardless of the hazards of transportation, handling and site conditions. They were originally designed for and are now used in numerous abusive applications by the U.S. and Canadian Armed Forces and NATO. Anything that can be damaged by everyday hazards is safe in a Pelican Protector Case. Impact copolymers used in Pelican Cases are much better than brittle ABS materials used in cheap alternatives. Impact copolymers used in Pelican Cases contain high levels of ethylene which provides considerable resistance to radiation - a great feature for the medical industry. The ethylene copolymers of polypropylene are in routine use in medical syringes which undergo radiation sterilization every day. 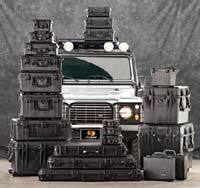 More Pelican Cases are sold everyday to countless industries, including the medical and security industries than any other injection molded case. 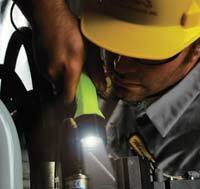 Pelican flashlights are the most safety approved flashlights on the market today. They also have numerous other safety features such as, gas absorption pellets, patented pressure release valves, patented lamp modules and battery polarity trays. The addition of internal hydrogen pellets to all Pelican lights is still another safety first. Introduced in 1976 to the industrial flashlight world, they are now the benchmark for high quality standard in industrial lighting. Introduced in 1990, Pelican's safety engineering changed the industrial flashlight world forever with the introduction of the "PRV", which allows hydrogen gas pressure to quickly escape sealed safety approved lights that could contain defective, reversed or overdriven cells. All FM approvals have been changed and are now based on Pelican's research and development contributions to the industrial flashlight community. Pelican's sealed and open face one-piece patented safety approved lamp modules combine tough abuse proof protection with unsurpassed lumen value (true light emitted) and focused white non-shadow light reflection. The battery polarity tray makes operating the flashlight impossible if one or more cells are inverted. This safety innovation guards against dangerous "outgassing" from an accidentally reversed cell (which is a major cause of flashlight accidents, in and out of hazardous environments). Why Won't My Flashlight Work? In order to troubleshoot a non-working flashlight, we need to start at the beginning of the line, the battery, and work your way back. Some tests for a non-working flashlight are simple; others require special tools like a volt meter. Dead Battery: The most common reason your flashlight won't work is a dead battery. Replace the questionable batteries with a fresh set. Do not mix used and old batteries. Very frequently, problem is solved after replacing batteries. Battery Corrosion: Over time battery connections can become dirty, or corroded due to acid leak. This corrosion breaks the connection of the battery with the rest of the flashlight components. If you find your batteries to be dirty or corroded, replace with a fresh set. NOTE: Pelicans Lifetime Warranty Policy does not cover alkaline or rechargeable batteries. Burnt Bulb: The next step of troubleshooting a Pelican flashlight is to test the bulb. Use a new fresh set of batteries to test the bulb. If bulb does not work, the filament has burnt and whole bulb assembly needs to be replaced. Be sure not to touch the bulb itself when replacing the lamp module. High performance bulbs that get hot during use must not have any skin oils on them. Any residue on the surface of the bulb can result in the glass cracking and breaking. Pressurized bulbs can break if this happens. If you do touch the bulb, clean it with rubbing alcohol. NOTE: Pelicans Lifetime Warranty Policy does not cover bulbs. Bad Connector: One more possibility is that the outer edge of the bulb housing is not making the proper contact with the battery retainer or module contact. Replace retainer or module contact if damaged.